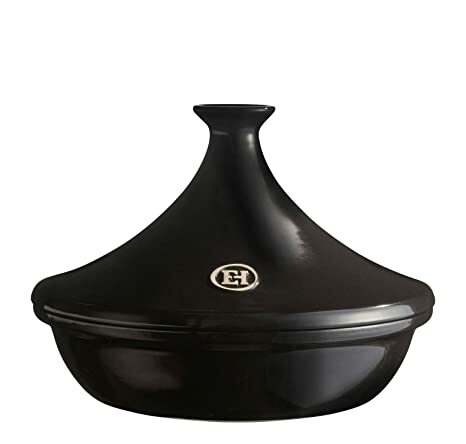 Emile Henry presents a collection of beautiful, oven-safe, ceramic mixing bowls designed to be kitchen staples for mixing batters, salad dressings or marinades; for storing leftovers; for whipping up eggs and for serving salads and pastas. These all natural, mixing bowls feature deep sides so bakers and cooks have ample working room to stir, mix and whisk. 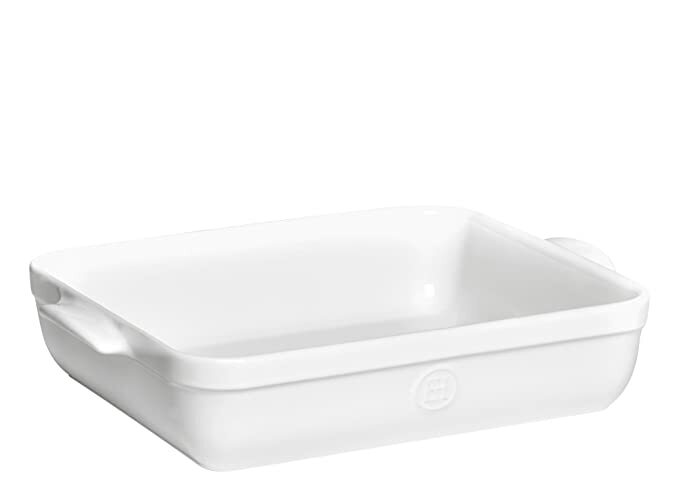 Like Emile Henry ovenware, the three new mixing bowls are so durable and heat resistant that they can go safely go in the oven, the microwave and dishwasher and can withstand the rigors of kitchen use without chipping or cracking. 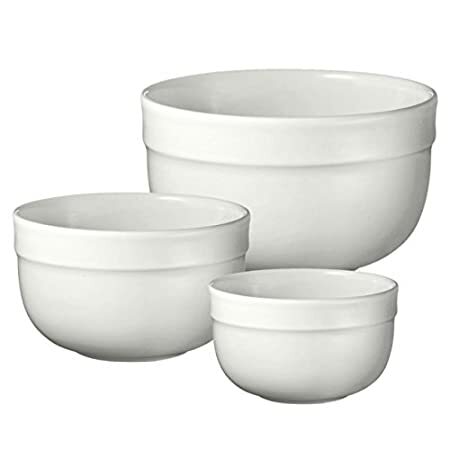 The interiors of the bowls are glazed in the crisp Emile Henry blanc. The exteriors are glazed in the Mediterranean colors. The simple lines and translucent glazes are both elegant and striking making the Mixing Bowls lovely serving bowls and kitchen accents. Use on the table for a fruit bowl or for mixing your favorite cake batter, Emile Henry’s bowls for the kitchen are beautiful and practical. We want the things you use in the kitchen to be both what you love to see and what you love to use. 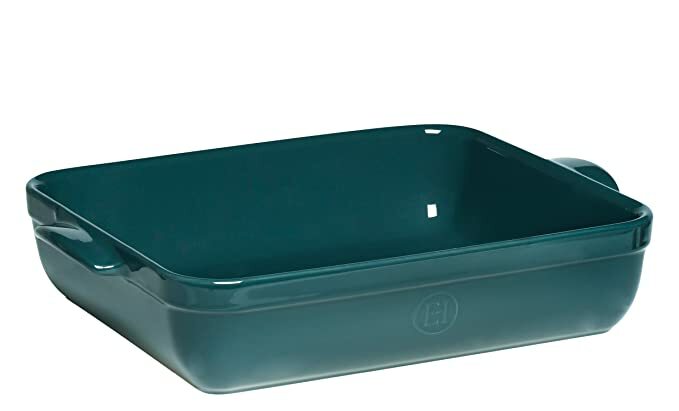 The bowl has the same properties as Emile Henry bakers which means it maintains hot or cold so it is great for potato salad or side dishes. Since 1850, Emile Henry has produced in France a large range of high quality ceramic cooking utensils. With a 10 year guarantee, our products are made from natural materials and have been designed and manufactured in France, in Southern Burgundy. Emile Henry unveils Modern Classics, an American inspiration and the first significant launch of an Emile Henry collection since the original pie and lasagna dishes debuted in the early ’90s. Modern Classics is a range of cookware and bakeware that has been on the drawing boards for many, many months. It is truly an American collection as the shapes, capacities, and dimensions were developed with an eye toward American foods, style and recipes. All of the shapes have been designed from the ground up to attract the American consumer while preserving the intangible design elements and the performance properties of Emile Henry. Deep enough for 4- 6 layers of lasagna or you can make a delicious moussaka or even a tiramisu ! A family dish, it is easy to manipulate thanks to its comfortable handles. All Emile Henry products are made in France and offer a ten years guarantee. A new line for emile henry in 2012, natural chic takes you into an authentic universe of soft, natural tones. Your house becomes a warm cocoon, creating a harmony of delicate colors and rounded shapes for cooking with pleasure. Our dishes have always been produced in france in marcigny in the south of burgundy: it is a tradition and savoir-faire which has been handed down from generation to generation. Each worker prepares his molds, produces his dishes and signed each one with his initials. We are proud to offer products made from very high quality ceramic, which pass very rigorous quality control by our team. We are therefore pleased to offer a 10 years guarantee on all emile henry products. Our warranty covers any production fault or quality problem with the product when used in a normal domestic environment, and respecting the care and use instructions. Any variation in the finish of the item is due to the handiwork carried out in our workshops and does not alter in any way the culinary qualities of our dishes. Since 1850, Emile Henry has produced in France a large range of high quality ceramic cooking utensils. With a 10 year guarantee, our products are made from natural materials and have been designed and manufactured in France, in Southern Burgundy. Controlled production, without waste, is part of our daily commitment: the CO2 expelled from our workshops is particularly low thanks to our modern firing techniques that require less energy. The waste in general is recycled and the water used in production is filtered and used again in the production process.Our dishes have always been produced in France, in Marcigny in the south of Burgundy: it is a tradition and savoir-faire which has been handed down from generation to generation. Each worker prepares his moulds, produces his dishes and signs each one with his initials. We are proud of this responsibility entrusted to each of our workers, which is a pledge of quality for all our production.Thanks to our innovative Flame ceramic, our stewpots offer all the advantages of cooking in ceramic : slow, even cooking which brings out the flavours of your ingredients. The lid makes sure the flavoured condensation circulates inside thanks to the dots underneath. Our range of stewpots is designed for use on all types of stove top (with an induction disk for induction hobs) and in the traditional oven. Easy to clean, they are dishwasher safe and will not lose their colour. All Emile Henry products are made in France and offer a ten years guarantee. Emile Henry Flame Top cookware, a technological innovation. An innovation in ceramics technology, Emile Henry’s new line of Burgundy Clay Flame-Top ceramics products work directly on a gas flame or an electric or halogen hob without a diffuser, without any fear of cracking or breaking. Much lighter, (30), than many types of comparable metal cookware products, Flame-Top is microwave and dishwasher-safe, cleans up very easily, is extremely strong and durable, goes under the broiler, and can go directly from a freezer or a refrigerator to a hot oven to the table, where it will retain the cooking heat for a very long time. This recent innovation from Emile Henry is a break-through in ceramics technology. 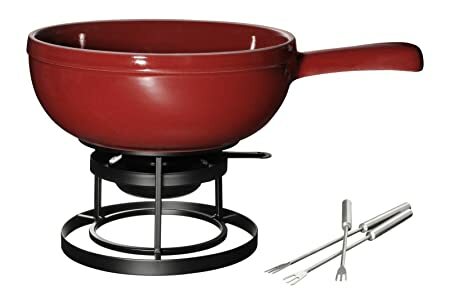 Unlike most metal cookware products, Flame-Top cookware can sit on a very hot open flame for an extended period of time without any ingredients in the cook pot, and they will not crack, discolor or break. 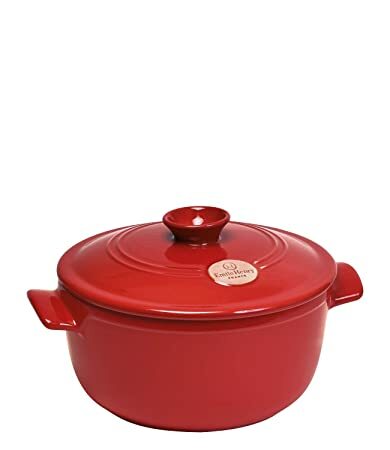 Perfect for braising, browning and slow cooking due to the incredibly gentle heat distribution properties of Burgundy Clay, Flame-Top products cook evenly and thoroughly when used on top of the stove, in the oven or even in the microwave. Enhancing this gentle cooking action are raised dots on the underneath side of each lid that evenly distribute evaporated juices directly back into the cooking food. This self-basting technique produces a more thoroughly cooked, tender and moist dish than with traditional lids, which force liquids to run down the sides of the pot, and which contribute to uneven cooking. 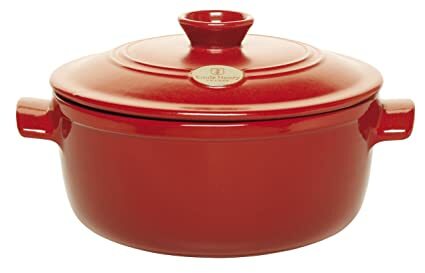 Emile Henry Flame-Top ceramic cookware is light and versatile, and better brings out the flavors of all cooked foods. Since 1850, Emile Henry has produced in France a large range of high quality ceramic cooking utensils. With a 10 year guarantee, our products are made from natural materials and have been designed and manufactured in France, in Southern Burgundy. Controlled production, without waste, is part of our daily commitment: the CO2 expelled from our workshops is particularly low thanks to our modern firing techniques that require less energy. The waste in general is recycled and the water used in production is filtered and used again in the production process.Our dishes have always been produced in France, in Marcigny in the south of Burgundy: it is a tradition and savoir-faire which has been handed down from generation to generation. Each worker prepares his moulds, produces his dishes and signs each one with his initials. 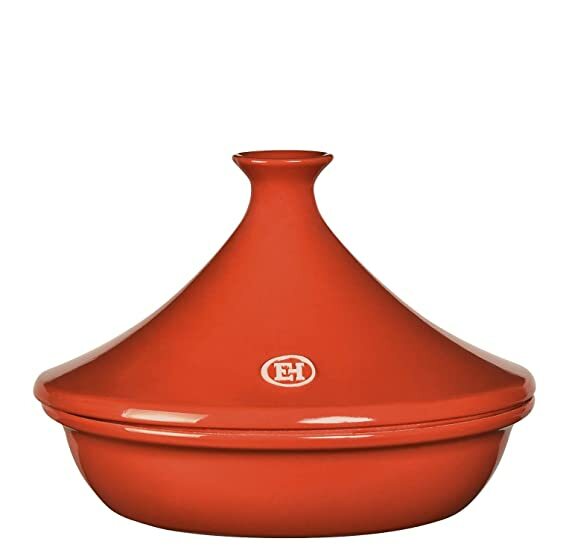 We are proud of this responsibility entrusted to each of our workers, which is a pledge of quality for all our production.Made from Flame Ceramic, our tagine can be used either directly on the heat or in the oven, and allows you to make delicious tagines, stews and any other recipe which requires simmering. It can be used on all direct heat sources: gas, electric or halogen (with an induction disk for induction hobs) and in the oven. Our Flame ceramic has been designed specifically for slow simmering, which brings out the flavours in the recipe. The lid has a unique shape, which allows the steam to circulate and helps keep the ingredients tender and moist. Ideal for 6-10 servings. All Emile Henry products are made in France and offer a ten years guarantee. Since 1850, Emile Henry has produced in France a large range of high quality ceramic cooking utensils. With a 10 year guarantee, our products are made from natural materials and have been designed and manufactured in France, in Southern Burgundy. Controlled production, without waste, is part of our daily commitment: the CO2 expelled from our workshops is particularly low thanks to our modern firing techniques that require less energy. The waste in general is recycled and the water used in production is filtered and used again in the production process.Our dishes have always been produced in France, in Marcigny in the south of Burgundy: it is a tradition and savoir-faire which has been handed down from generation to generation. Each worker prepares his moulds, produces his dishes and signs each one with his initials. We are proud of this responsibility entrusted to each of our workers, which is a pledge of quality for all our production.Our Bread loaf baker allows you to bake all kinfs of home-made bread (for sandwiches, gluten-free, rye bread. ), with a crispy crust and soft inside. 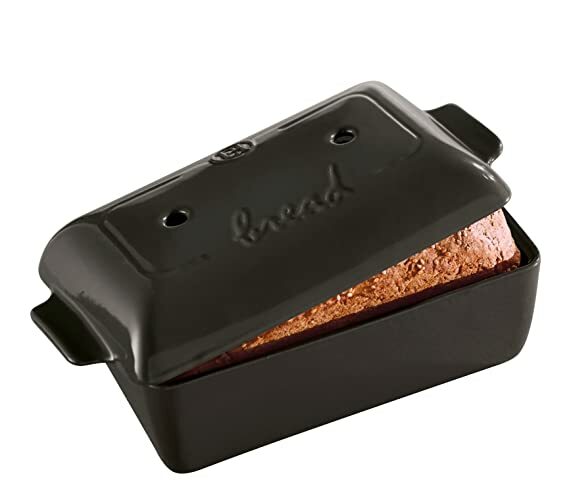 The refractory ceramic and domed lid create the right level of humidity during cooking to get a perfect loaf. The holes in the base and lid help the dough to rise and create a dry, crispy crust. The ridges on the bottom prevent the dough from sticking. The handles on the lid make it easy to manipulate. All Emile Henry products are made in France and offer a ten years guarantee. Since 1850, Emile Henry has produced in France a large range of high quality ceramic cooking utensils. With a 10 year guarantee, our products are made from natural materials and have been designed and manufactured in France, in Southern Burgundy. Emile Henry unveils Modern Classics, an American inspiration and the first significant launch of an Emile Henry collection since the original pie and lasagna dishes debuted in the early ’90s. Modern Classics is a range of cookware and bakeware that has been on the drawing boards for many, many months. It is truly an American collection as the shapes, capacities, and dimensions were developed with an eye toward American foods, style and recipes. All of the shapes have been designed from the ground up to attract the American consumer while preserving the intangible design elements and the performance properties of Emile Henry. Our oval dish is elegant on the table. The high sides are practical for making gratins or even desserts. The large choice of colors available makes it easy to mix and match with your other Emile Henry dishes. Made from HR ceramic (High Resistance), it can go directly from the freezer to the hot oven, microwave and dishwasher. 10 year guarantee.